Etsy is a great marketplace for handmade, vintage or craft supply items. If you are unsure about the types of products to list on Etsy, glance through their categories and see if your products would be a great fit on this listing channel. 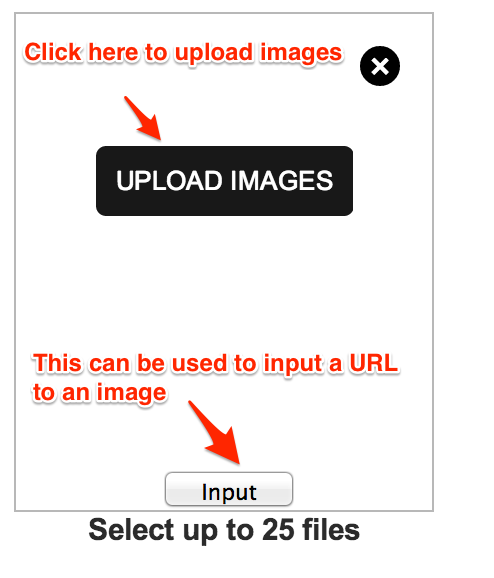 Prior to listing on Etsy, you will want to set it up properly under Settings. Follow this guide to help you with that. 7. Scroll down to the Etsy options on the listing page. If you entered the Title at the top of the listing, it will automatically be used. You only need to enter a different title here if you want to use something different than other channels (assuming you are listing on other channels). 8. Materials are separated by comma and you can add up to 13 options. If you enter more, they will be ignored by Etsy. 9. Price is used if you want to enter a separate price from what was entered at the top of the page. If you want to use the same price, feel free to leave this blank. 10. Who Made and When Made are drop down selections that can be defaulted in the Settings Page if you list the same type of items. 11. Supply is only an indicator if the product you are selling is a craft supply. In order to list a supply, you must be approved by Etsy. 12. 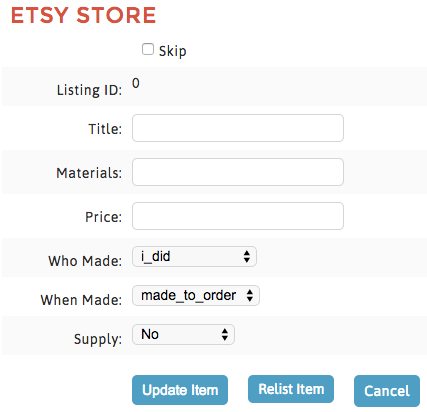 If you only want to list to Etsy, you must click Skip next to the other channels. Once you have made your channel selections, click Add Item to list the item.